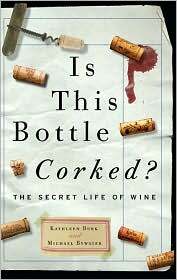 Wine Book Review: Is This Bottle Corked? ‘Is This Bottle Corked’ is a wine book to answer all the ‘really important’ questions about wine. The definition of importance must be taken a bit broadly here as most of the questions are rather academic and historical in nature. The book answers 88 questions ranging from the very practical “What can you do with leftover wine” to the extremely random “What did Jane Austen recommend for heartache” to the rather obtuse “What wines did Chaucer’s pilgrims drink?” Each question, regardless of how obscure, is well written and intriguing with a dash of the authors’ personal lives to bring a bit of humor when necessary. While we found some of the questions to be far too academic (“Why did Omar Khayyam write so much about wine?”) most were just the kind of information that might come in handy when at a party with too little interesting conversation. A wine book recommended for anyone interested in the quirky side of wine and looking for good conversation starters.